Thank you for taking the time to read this blog, and thank you for all of your prayers and support. I pray that in some way that what you read here will be as much of an encouragement to you as you have been to me. The semester is coming to a close here at UT Arlington. Many of the students are currently taking their finals, some will soon be graduating. So just the other evening we had our whole leader team together and took time to just give thanks to God and share stories of what he has done in the lives of college students this semester. There were students emphasizing how much they've been learning from scripture, students expressing how much they have benefited from the friendships that they have been experiencing in core, stories of students ministering to their peers about the truth and good news of Jesus. I'm so thankful for all that God has done. I'm specifically very grateful for each one of these student leaders. 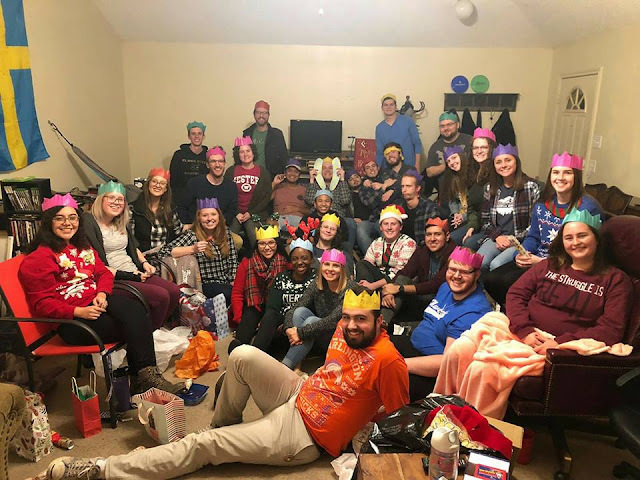 Every single one of them takes time out of their week to evangelize to their classmates, to read scripture with other students, and to generally just make Jesus known on their college campus. We could not do college ministry to the extent that we currently are without them volunteering their whole year to serving in ministry. Thank you for providing a place for so many of them to come and learn how to lead others to know Jesus. Through your investment the college campus is being transformed. Another really exciting thing that happened this month was Pizza Theology! Every semester over 400 students from the different campuses will gather together for a four hour lecture on a different topic pertaining to christian theology. With a one hour break for pizza in between. I am always so encouraged by what God has done in the hearts of the students in our community. These are 400 college students voluntarily listening to a 4 hour lecture on "Telling The Whole Story of Scripture". God has proven to me through these students that this next generation of young men and women is absolutely capable of becoming Christlike leaders of our churches, of their homes, in their places of employment, and everywhere else that they may go. Be encouraged! God is lifting up a generation of young people who gladly desire to know their God! Also just as a thank you to all of you and to the rest of the generous donors that support college ministry, FOCUS has hit our goal for our annual Keep FOCUS Growing Fundraiser. So a huge huge thank you to everyone who gave and contributed to that. Because of the success of that fundraiser FOCUS will be able to have access to the resources needed to reach the college campuses in DFW in the name of Jesus. So thank you thank you thank you. As always don't forget to read the student testimony down below! I pray that you all have a very merry Christmas with your friends and families. I hope to catch up with several of you over the break. Never hesitate to reach out if you'd like to hear more from me in person about what God is doing at UT Arlington. I'm so grateful for your support and I would love to get dinner with you any time that you'd like so that I can more fully express that gratitude. In Christ, Austin.